Ahead of the 2016 edition of Paris-Roubaix, we take a look at the some of the tech and modifications that the riders will be adopting to ease the suffering on the pavé. It’s not just the riders that take a battering when assaulting the brutal cobbles of the Hell of the North, the bikes take a hell of a pounding too. In order to tackle the bone shaking cobbles of Paris-Roubaix many riders have their bikes modified, or use bikes specifically designed to tackle the pavé. We recently reported on the new Trek Domane of Trek Segafredo and also the new Merida Scultura Disc of Lampre-Merida, both of which will see their Paris Roubaix debuts this year. Here we present some of the tech and hacks used by professional teams in effort to enter the Roubaix Velodrome first. The Pinarello Dogma K8-S used by Team Sky features a shock absorber, but many of the bikes used by other teams feature dampening too. The Trek Domane is a bike known for its prowess on the cobbles, with previous versions having been ridden to victory in Paris-Roubaix by Fabian Cancellara. Set to make its Paris-Roubaix debut, the new Domane features an adjustable IsoSpeed vibration dampening system that allows riders to alter the bike’s compliance based on rider preference and the terrain and there is also a second IsoSpeed dampener at the front of the bike too. The FDJ bike of choice is the dampener equipped Lapierre Pulsium. The Specialized sponsored teams will be riding their tried and tested S-Works Roubaix SL4 bikes. Rather than the standard 53/39 chainset, many riders favour a 53 outer with a larger 44 tooth inner ring. This is deemed preferable because the gap between the two rings is smaller, reducing the chance of dropping a chain at a crucial moment. In addition, Paris-Roubaix is not very hilly, so many riders do not feel the need for a 39 tooth ring. Interestingly the 44t ring is not simply bolted in place of the 39t ring on the existing chainset. Shimano claim that you can’t take a Dura-Ace 53/39t chainset and fit a 44 or 45t chainring without reducing the shift performance. Shimano actually produces a specific 53t chainring with the pins and ramps in different places to maintain optimal shifting. Owing to the flat parcours many riders, including Sagan, have opted for an 11-25 cassette, rather than the 11-28 they use most of the time. Peter Sagan has opted for an 11-25 cassette and mechanical Dura Ace. Being ever so slightly old school, Fabian Cancellara favours mechanical Dura-Ace over Di2 in all races. Peter Sagan normally rides Di2, but for Paris-Roubaix he is opting for mechanical. Tinkoff mechanics told us this is because in 2015 he suffered a problem with his Di2 at a crucial moment in the race and for peace of mind is certain that he wants to use mechanical this year. Tyre choice is critical in Paris-Roubaix, with a puncture at the wrong moment easily able to cost a rider victory. 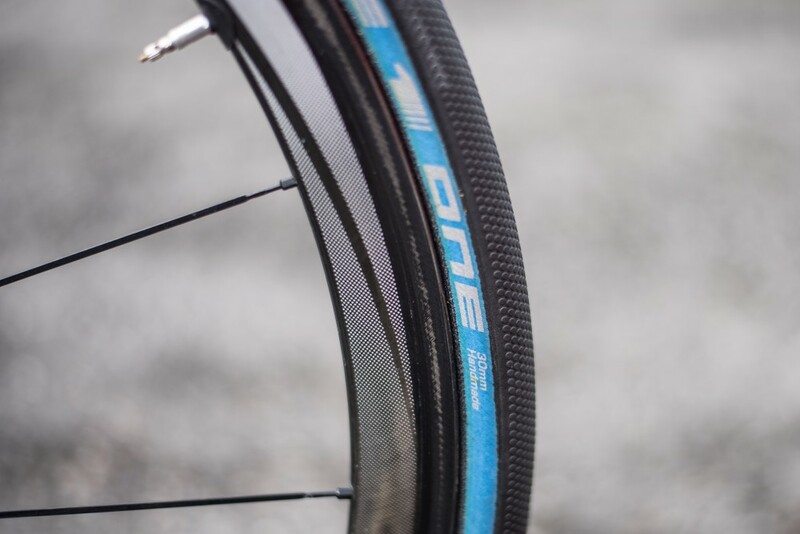 23-25mm tyres are most common in normal road races, but for the pavé this increases to 27-30mm. Just as 25mm is the new 23mm on the road, it would appear 30mm is the new 27mm on the pavé. The added width, improves comfort and dramatically reduces the risk of punctures. Regarding brands, FMB appear to be the tyres of choice for many teams. Interestingly, Tinkoff-Saxo and Etixx were using modified FMB tubular carcasses, with a Specialized tubular tread. The mechanics told us that the Specialized tred offered superior rolling resistance. The Continental sponsored teams, all seemed to be using the sponsors products, although the Competition Pro Ltd tyre is only available for professional use. 40mm appears to be the wheel depth of choice for many teams and riders. The slightly shallower depth is said to afford more comfort than deeper wheels. Some mechanics have been known to inject sealant into the tyres for added puncture protection. However, this cannot be done if the tubular tyres have latex inner tubes, as this reacts with the sealant. The big news this year is that disc brakes will make their debut on the Paris-Roubaix pavé, when Lampre-Merida start the race with the new Merida Scultura Disc. It remains to be seen if this offers a significant performance benefit to the professionals, although because hydraulic discs only require a light touch, it can make life easier for hands and wrists that have been battered by the cobbles. To cope with the wider 30mm tyres being used, mechanics sometimes have to open the brake calliper to give sufficient clearance. Alluding to his cyclocross pedigree, Zdeněk Štybar has opted for additional brake levers on the bar tops. This preference appears to have rubbed off on several of his Etixx team mates with Tony Martin amongst the others also opting for the additional brakes. Some riders tend to try and aleiviate the shocks from the cobbles by riding on the tops, so brakes and shifters placed here can be very useful. Having the additional Di2 shift boxes on the tops means the riders don’t have to move their hands while bouncing around on the cobbles. Many were simply zip tied on. In order to reduce vibration through the hands and wrists, some riders request gel inserts on the bars, or double wrapped bar tape. While double wrapped bar tape was seen on several bikes, a large number of riders appeared to be using a single layer. Sagan’s Roubaix had just a single layer of Supacaz bartape, something he had specifically requested. 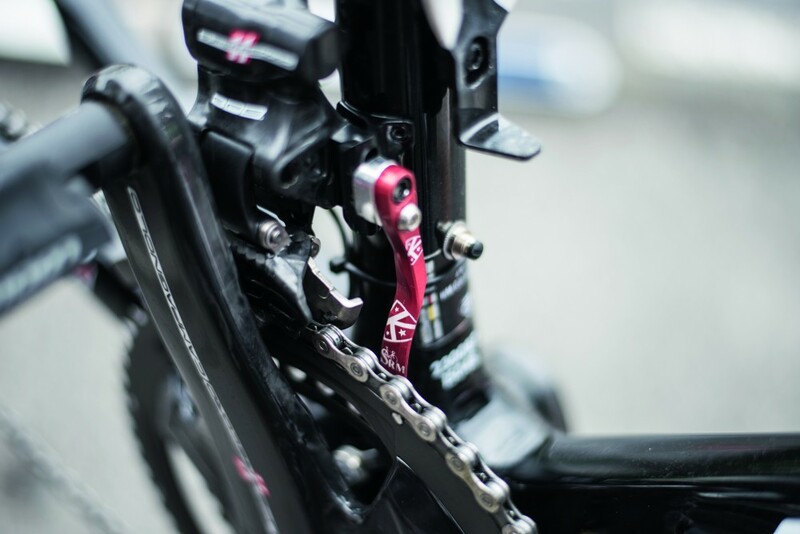 To further reduce the risk of a dropped chain at a crucial moment, many riders adopt chain catchers. Here we see a chain catcher being employed by Lotto-Soudal. The cobbles have been known to shake bottles free from the cages. This not only has the potential to cause crashes, but can deny a rider necessary fuel when they need it most. To counter this many riders adopt special cages, with the Elite Ciussi cage being a popular choice. Grip tape, more commonly associated with skate boards, is also used on the cages to further secure the bottles. Etixx riders are using Tao cages to further secure their bidons, where as Tinkoff has chosen to employ board tape on the inside of its cages. When riding a long race with so many cobbled sections it is good to be able to know what is coming next. To facilitate this many riders had notes attached to their stems and, in some cases, top tubes. It may not be unique to Paris-Roubaix, but the DuoTrap integrated speed and cadence sensor found on Trek bikes comes into its own on the cobbles. Compared to a conventional zip tied sensor, there is no chance of it vibrating or moving out of alignment with the magnets. Giant-Alpecin have a similar system too. By comparison, the fork mounted, zip tie sensor required for SRM power meter equipped bikes, looks very antiquated. Tinkoff bikes were also fitted with Ceramic Speed jockey wheels #marginalgains. Considering all the modifications and changes made to kit and bikes, the real unsung heroes of Paris-Roubaix are without doubt the team mechanics who have a vastly increased work load and increased pressure for this single day race. Just one of the things that makes Paris-Roubaix so special.